Birthday Parties are Fun at KCIC! We offer birthday parties during our public session times. There is a current calendar below to give you the times of the public sessions. We have a room that is used to set up for 1 birthday party during the public session. The Maximum for each party is 25. There are 2 packages that we offer. Check the Flyer for more details! Most parties start off with skating for about an hour and then come in for a break/snack and then go back out for more fun! This is very flexible to whatever works best for you. From November till March, all our public sessions are held outside on the Pavilion Arena. It has a roof on it, so there is no worry about getting wet in case it snows or rains! Also from November - February are our busiest times, so book EARLY!!!! For children 8 and under, there can be a Skating assistant booked to help get on the skates and help them while they are on the ice. She is there to help the first 90 minutes for only $20. 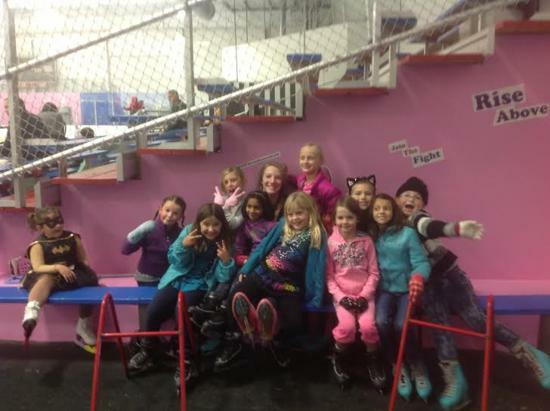 If you have anymore questions or concerns, please email Clara Gentges at parties@kcicecenter.com, or if you want to book your party call 913-441-3033. You can book a 2 hour slot on Friday's, Saturday's, or Sunday's from 11a - 1p, 1p - 3p, or 3p - 5p. The party table and skating are held on our outdoor Pavilion. These parties are available from April through October. Check out flyer above for more information. email Clara Gentges at parties@kcicecenter.com with any questions.